Follow these steps to download and install the latest version of Insight. 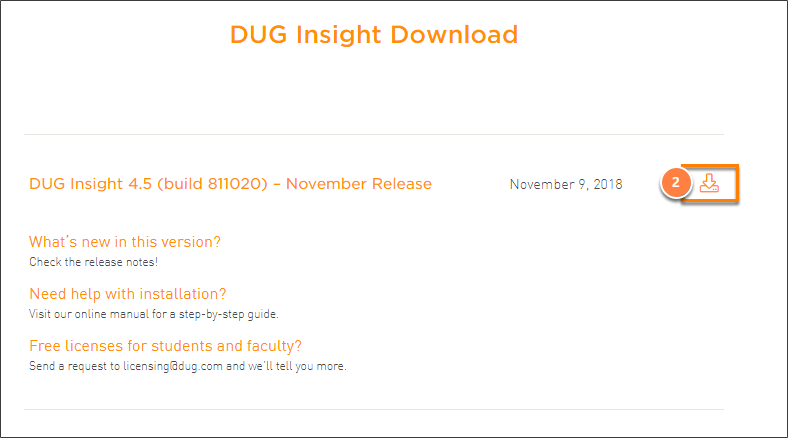 For information on recent changes, see DUG Insight release notes. Note: For silent installations or administrators installing via SCCM, see How do I install Insight silently or via SCCM? in the FAQ section. Choose your operating system from the drop-down menu. The download should automatically start. 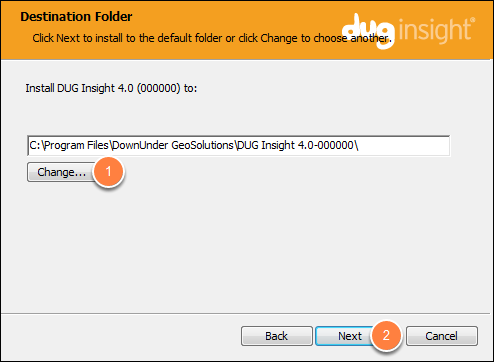 Find the DUG_Insight<version>.msi installation file in your Downloads folder or where the installer was saved and double-click. Before release, every DUG Insight installer is tested, validated and signed with a certificate to ensure its authenticity. Depending on your system configuration, you may be prompted with a security warning. Click the More info link to show app and publisher information. Click Run Anyway to start the setup process. untick this check box to add the new version without uninstalling earlier versions. Tip: If you have more than one existing versions in your machine, you can selectively uninstall by opening your computer's Control Panel and clicking Uninstall a program. Find the version of Insight you want to remove and click Uninstall. Read and accept the Licence Agreement to proceed with the installation. Click Print to print a copy of the Licence Agreement. Click Next to proceed (unclickable until the terms in the Licence Agreement is accepted). 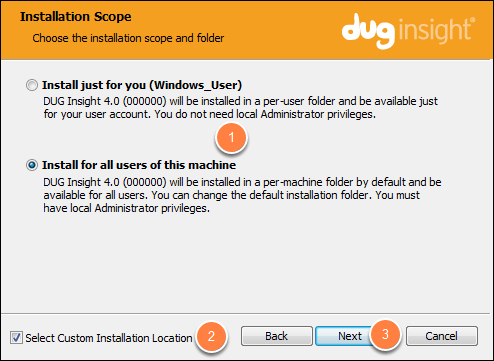 Just for you — The installer will install Insight in a default system location for user based installations. To install Insight just for you, you do not need Administrative privileges. For ALL users of this machine — The installer will install Insight in a general folder accessible to all users, i.e. C:\Program Files\. To install Insight for all users, Administrative privileges will be required. Click on the Select Custom Installation Location check box to change the default installation folder in the next window. If you have selected to change the default destination for the installation, the Destination Folder window will be displayed. Click Change and browse to the desired directory. Click OK. Note: From Windows Vista onwards, administration rights is required to write to some system folders (e.g. Program Files). Installing "just for you" does not require administrative rights. Therefore, there are some limitations on where you can install Insight. We recommend installing in the default locations. If you have administrative rights, we recommend installing it for all users. 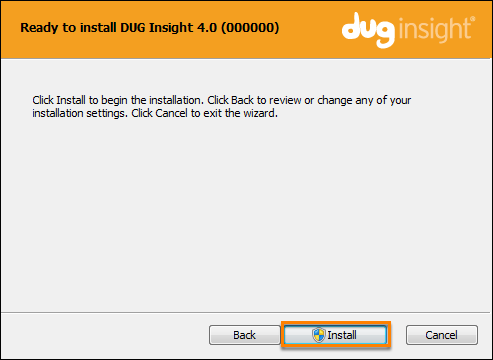 In addition to installing DUG Insight, select other features that might be useful to you. 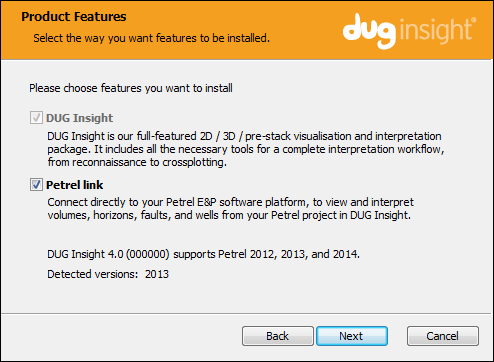 If you have the Petrel E&P software installed on your machine (see How Insight detects the Petrel Installation), the Setup Wizard will provide you with the option of installing the Petrel Link to connect and share data with your Petrel project in Insight. Click on the Petrel link check box to install it together with Insight (see Installing the Petrel Link). The Petrel software MUST be closed before running the installation. The installation will not be successful if Petrel is running in the background. If you already have the Petrel Link installed for an older version, that version will no longer work and needs to be manually removed before you install the new version. To manually remove previous Insight plugins from Petrel, see How do I manually remove the Petrel Link? You have chosen to install just for one user. You will NOT be able to install the Petrel Link if you have chosen to install for a single user, because the Petrel Link needs to be installed in Program Files by an administrator. Note: If you have selected to install for all users, a Shield icon will appear beside the word Install to remind you that you need Administrative privileges. The User Account Control window will appear after you click Install. 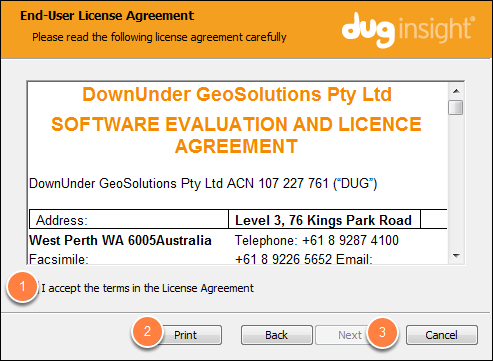 It should say that it was verified by DownUnder GeoSolutions Pty Ltd. Click Yes to continue. You can monitor the progress of the installation via the Status bar. Once the installation is completed, click Finish to exit the Setup Wizard. The software has now been installed and a shortcut will be created on your desktop. A DownUnder GeoSolutions folder is also added to the Start menu. 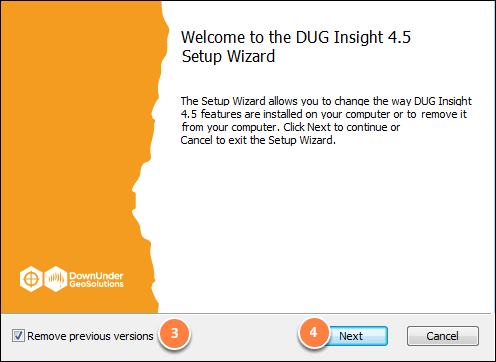 Double-click on the shortcut or select the program from the Start menu to launch DUG Insight (see Launching Insight). Note: By default, Insight automatically checks for updates and will notify you when a newer version is available. You can manually check for updates from within Insight (see Checking for Updates).